I made semlor at the wrong time of the year and they inspired me to continue baking out of season Swedish treats. 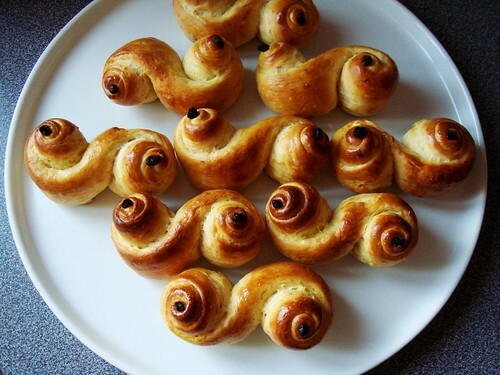 I bookmarked Joe Pastry’s recipe and step-by-step pictorial for lussekatter (St Lucia buns) for a very long time. What better time to try it out than May when they traditionally ought to be eaten at the darkest time of the year (that would be December)? 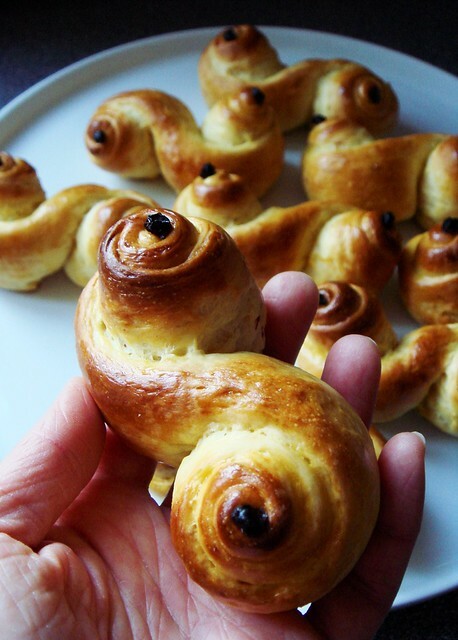 Lussekatter is part of the St Lucia Day celebration. 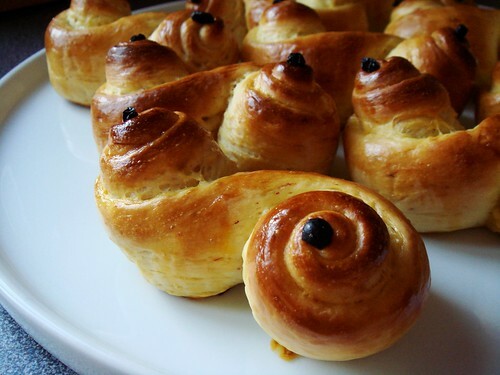 The saffron buns in their bright yellow hue indeed make me think of light. Daylight is not in short supply now that we stepped into May. On a good day, it is still bright outside at 8pm! According to the weather forecast, the official sunset time is actually 8:25pm as of May 5. In fact, my skating club kicked off our summer practicing schedule with training beginning at 6:30pm. That’s a good thing because I can avoid some after-work traffic to get to practice on time. Spring 2014 looks to be a bust. We are more than 6 weeks into the season but everywhere I look is still various shades of brown and gray. No buds on the trees yet. Only a few brave tulips and hyacinths poked out of the cold soil to remind us spring is here. Normally I would be very restless by now. However, the last two years of health issues have taught me an important lesson. I am thankful to have a body that allows me to be active. A bit of cold and wind may be unpleasant but it still beats sitting on the couch because I could not do anything else. I started baking my lussekatter at 10 in the evening and it was 2 in the morning when I went to bed. I used to do that all the time until I got sick. I did not realize it at the time but I was so lethargic that I could not muster up energy to do much in the evening. When I looked at my tray of freshly baked buns in the wee hours at night, I could not believe that I am back to my energetic self once more. There are lots to be thankful for. 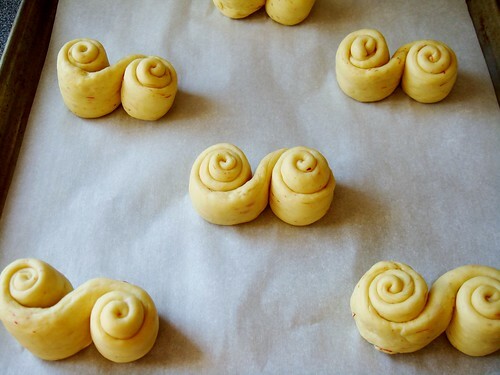 Shaping the buns was so much fun. Flattening the dough rope was key to creating an attractive swirl with many layers. I even bought a big box of currants to recreate the signature look for these buns though I only needed a handful. I admit that I used cheap saffron. There must have been a pricing fluke because this takeout container only cost me $1.81! The saffron is of inferior quality but there is a time for inferior saffron. Another special ingredients for lussekatter is quark cheese. This fresh cheese is mild in flavour and very low in fat. It is not terribly popular in North America but a local creamery makes a good version readily available in many grocery stores. I remember seeing quark cheese sundaes as ubiquitous as frozen yogurt stores when I traveled to Germany. Lussekatter is delightful to make and eat but I think cinnamon rolls have a slight advantage. Cardamom and cinnamon have that special power over me. However, next time I want to create a break basket assortment, I’ll be sure to include these saffron beauties. They are too pretty to pass up.